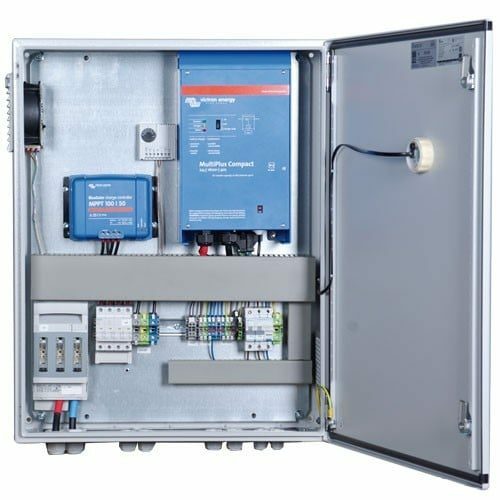 All electrical components are pre-assembled and pre-wired in a compact control cabinet. Each system is tested and delivered ready-to-operate. The plug‘n‘play concept guarantees a simple and error-free installation and commissioning on site. The Plug N Play Power System Smart Energy Multi Power Pro AC1600 cabinets are equipped with inverter in combination with PV MPPT charge controllers. All systems include a battery monitor for accurate battery state of charge determination. An optional upgrade enables remote control and monitoring. The Plug N Play Power System Smart Energy Multi Power Pro AC1600 cabinets are available for wall and/or ground installation. A thermally controlled fan system maintains a constant temperature inside the cabinet and ensures a long life of the electrical components.